Don’t let the short ingredient list fool you. 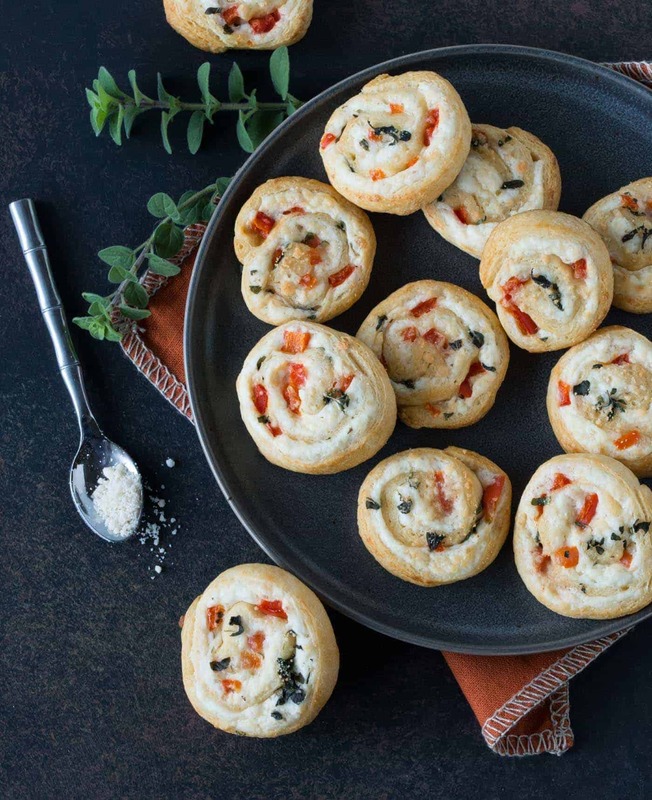 These Easy Parmesan Pinwheels are packed with flavor and are a great addition to your party menu. Super Bowl weekend is finally here and the entire state of Minnesota is ready to host the big party. Appetizers are one of my favorite things to serve when entertaining. It’s kind of ironic since I’m not really much of a snacker between my meals at any other time. But put some appetizers in front of me and a cocktail in my hand, and it’s a whole different ball game. It just seems meant to be; those little appetizer bites just pop right in your mouth. And that is just what you’ll do with these Easy Parmesan Pinwheels – just keep eating one more. Finding a new, easy appetizer is always a win for the books, especially one that has only 5 ingredients and is still packed with flavor. We had friends over for dinner a couple of weeks ago, and I was searching for some new appetizer recipes to try. 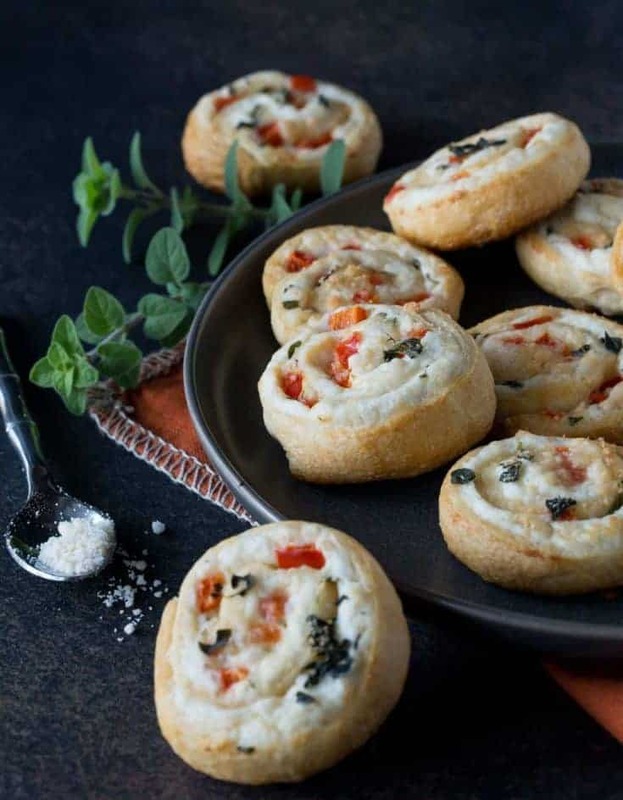 I stopped when I found these Easy Parmesan Pinwheels. 10 minutes to make and 15 minutes to bake…what’s not to love? The slightly sweet dough wrapped around nutty Parmesan, oregano and crunchy red pepper is totally addictive. And with the big game this weekend, it’s the perfect excuse to have a party. These Easy Parmesan Pinwheels are just what you need to make the menu complete. Small Bites make great party snacks! Don't let the short ingredient list fool you! These Easy Parmesan Pinwheels are great for any party! Lay crescent roll sheet out and roll out slightly. Line a baking sheet with parchment paper and set aside. Preheat oven to 400. In a small bowl combine cream cheese and parmesan cheese until well combined. Add red pepper and oregano and stir well. Spread the cream cheese mixture over the crescent roll sheet and roll starting from the long side. Using serrated knife, slice the log into slices 16 slices and place cut side down on prepared pan. Bake at 375 for 10-15 minutes or until golden brown. Serve warm. I usually order two appetizers when I go out to dinner! I always find them more appealing. These look perfect. I love how easy these are and they look totally delicious too! Appetizers are just such a fun snack to make and eat!!! These look awesome!!! I love easy appetizers. These looked so good I decided to try them tonight. Got everything on the counter I realized I only had a nub of Parmesan. Ugh! Only use the real thing, no canned stuff for me! Put everything back in the fridge and will go to the store tomorrow. Had my mouth all set. Thank Aimee for sharing. I hope they turned out! Thanks for stopping by! Oh YUM. Cheese and carbs in less than half an hour? I’m all over that. Right there with you, Stephanie! I’m a sucker for little bites food. I’m especially a sucker for little bites of bread with cream cheese in them. Yum! Me too, Nicole! Bread and cheese get me every.single.time. These are perfect little appetizers for a party! I love them. I looked at the picture and thought yeah right—easy—no way. Hey hey sometimes it is nice to be wrong. These are easy! I love serving appetizers, but this is a weak link with me. I put stars by this recipe as a keeper. Hi Carol, I’m glad they were easy for you, and delicious too! Thanks for the note!